Whatever else I am - a mom, a friend, an employee, a citizen - I am also a writer. It feels some days that writing to me is a bit like breathing, and so words take on incredible significance in my life. I play with them, I work with them, and I struggle with them on occasion, wrestling to find the words to adequately convey my thoughts or feelings. And sometimes I play games with them, considering a topic and then coming up with words to reflect on that topic. 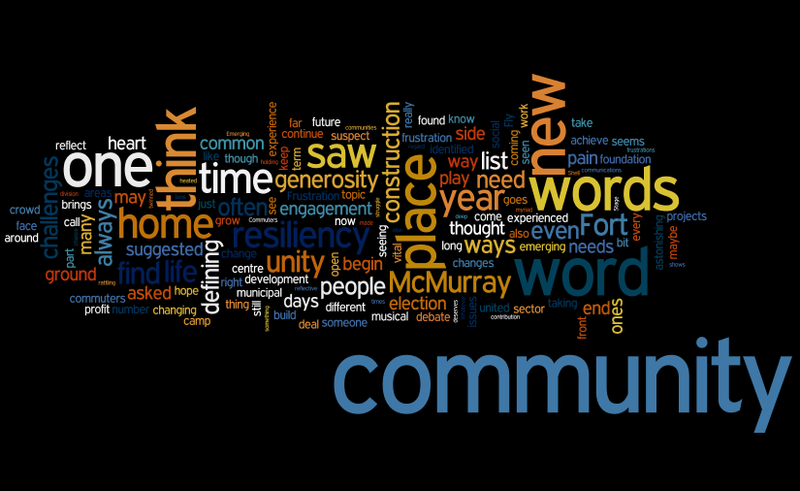 A few days ago on Twitter I asked people to described Fort McMurray in one word, and one word alone. What was the one word that sprang into their heads when I asked the question, I wondered. The answers were myriad and varied, and some were ones I had already identified as on my list while others were new and ones I had not considered. I know many people despise the "Top Ten" lists that come out at this time of year, but for me these words are the ones that keep rattling around in my brain when I think about this place and this community. These, for me, are the words that have defined us in 2013. You may have other words, and I would encourage you to think about those words - and reflect on why those are the defining words for you, and if you are happy with those definitions. Every new year brings new possibilities, and if you are unhappy with the words then maybe, just maybe, this year is the chance to find some new experiences - and some different words. I can't take credit for this one, although I love it fiercely. This community is emerging in so many ways, from taking our place on the world stage as a leader in resource development and technology advancements to coming of age as a community and urban centre. I think this place has always had a tremendous heart, but in 2013 I believe we saw community members begin to protect, defend, and promote this heart in ways we have rarely done before. We are under construction - literally and figuratively, from new projects like Shell Place to new overpasses to a twinned highway into our community. This construction is so reflective of what we do here - we build, we grow, we expand, and we are bold when we do it, taking on enormous projects but doing so with confidence and faith in the end result. Along the way we may experience some pain, but we know with growth comes pain, and so we forge through it - and anyone who has used the new roads by MacDonald Island knows the short term pain is well worth the long term gain. We are a region of commuters, of course, as many commute to their places of employment, but when someone suggested this I suspect they were thinking of the camp community, the "Fly In Fly Out" crowd who impact our community even though they do not call it home. This element brings challenges to our infrastructure as it swells our community, but it is, in the end, a part of our community that we ignore at our own peril. The camp workers, the FIFO crowd and contractors are vital for the functioning of our industry, and so we cannot turn up our noses to their contribution - or their needs. We need to find ways to enrich their experience of our community while also ensuring their needs are met - and even though it is a tricky balance, perhaps. I have been here for twelve years, and the changes have been astonishing. The most astonishing part is that the pace of change has not really altered, and has instead been picking up steam as time goes on. The changes are all around us - but I think they are in us, too, as the community seems to be changing as we grow and face new challenges and opportunities. If life is about change, then Fort McMurray is full of life indeed. This word is one that springs to my mind often in terms of this community, and it was one often mentioned when I asked for that one defining word. We are national leaders in philanthropy, but the generosity goes far deeper. There is a generosity of time here, with volunteers giving up hours of their time to both serve on boards and in the front line trenches of our social profit sector. What exemplifies this the most, though, is the generosity of spirit that shines in this place, and that seems almost infectious in nature. You see examples of it almost daily, and it renews the spirit every single time. In 2013 we saw a municipal election, and for the first time in a very long time we saw some fairly heated debate on the issues at hand. While numbers at the polls were still on the low side what was on the high side was emotions and involvement - and that engagement may be in its infancy still but there are signs of life where once one only found apathy. Political engagement often translates into engagement in other areas of community life, and what I witnessed during the election showed me that no matter what side one was on there was deep passion - which, in the end, can only be a good thing. When someone suggested this was the defining word I was intrigued - not because I thought they were wrong but rather because I thought they were so right, and I was frustrated with myself because I hadn't identified it. There was a lot of frustration over the usual issues you find in an urban centre, but for this place they were a bit novel because they are not something we have always experienced. Issues with traffic delays due to construction or weather or collisions threatened to boil over some days, but it was the other frustrations expressed that might have been the most telling. Frustration seemed to stem the most from a sense of a breakdown in communications in various areas, with residents feeling their wishes were either not being heard or that vital information was not being communicated to them. Far from this being a problem, though, I think it was a clarion call for everyone to do a better job at both talking and listening, because communication runs both ways. One of my favourite adages has always been "united we stand, divided we fall" - and far too often we have experienced division in this community that made progress tough to achieve. But unity doesn't always mean we need to all agree on everything - at times it means we must be willing to have the very toughest of conversations in order to dig down to the common ground, start from that foundation, and build up. I think we are seeing some of that happening now, and I hope that we will continue to see the foundation be laid for the united front this community not only needs but deserves. With the Convergence conference in 2013 we saw our social profit sector find unity in an entirely new way, and I think we are seeing some babysteps forward in this regard with our new RMWB council as they settle into their roles. I suspect - and hope - that 2014 is the year we begin to see real unity, forged on the basis of common ground and the development of a shared vision for the future, begin to become reality. There are probably some who think this should be the top defining word, but this year there is another word in that spot, and so home has been bumped to number two in this list while retaining its place as number one in my heart. Fort McMurray is synonymous with home for me and tens of thousands of people who have chosen this place. This isn't a boomtown, it's a hometown, and in 2013 we even saw a musical called Hometown come to the Keyano Stage and remind us why this is our home. Some of us loved the musical but didn't really need reminding - all we need to do is open our eyes and our hearts every day to remember why this is home. The funny thing is that this word can be connected with every other word on this list. Fort McMurray is resilient as we deal with construction, commuters, and frustration. This emerging, changing and engaged community shows its resiliency through our generosity and our unity, and over time our resiliency strengthens our home. Someone suggested this word, but it has topped my list for months now, after a year which saw terrible floods that ravaged our community but that saw our resiliency shine as we helped each other to cope, and to recover. I have seen our resiliency through a difficult municipal election, and through a debate over the long-awaited aging in place facility. I have seen our resiliency in how we deal with all these challenges, but even more so in how we have dealt with each other and how we have managed to continue to have dialogues on our future even when holding very divergent opinions. Resiliency, the ability to bounce back, to create common ground and to keep the dialogue open, is the only way to achieve unity - and to develop a home where people are proud to live, work, and play. We have plenty of resiliency in this place, the kind I think is similar to that of the early pioneers who had to face different challenges but who found themselves tasked with building communities and homes just as we are doing right here in Fort McMurray. And that is why in the end I think the word that defined us most in 2013 was "resilient", because it says so much about us, what we do, and what we are creating. And even more than that it speaks to the future, to 2014 and beyond when our resiliency will continue to help us to build, grow, and prosper. In order to build a home you must be resilient - and in 2013 we showed the world, and each other, the nature and strength of our resiliency. and all those who call this place home. than a few words ever could. Great post. I think your words on the words (and the Wordle) are very edifying and resonates with my sense of the place. I will be in McMurray much more in the new year. Hope to see more of my friends and find ways to strengthen Edmonton and RMWB together.